Last night the panel of judges and I partook in the Academy Awards. For much of the telecast this was a difficult task because so few of the important winners spoke English in the kind of proper American way which makes for a coherent viewing experience. Of course the last hour of the broadcast was dominated by the thoroughly American-centric Coen brothers. But instead of allowing their crystal-clear Midwestern enunciation to take the day and walk us down from the tower of babel, between two brothers and three shared Oscars barely a word was spoken. I guess the tall one did offer an anecdote about making films in the Minneapolis airport. But he made no attempt to spice it up with a Larry Craig punchline, and recited the story with an enthusiasm usually associated with the reading of a grocery list. 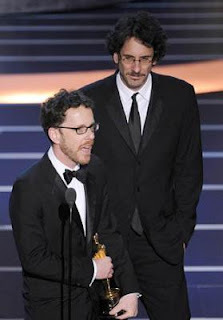 This was actually a step up from the rest of the Coen brothers' Oscar night demeanor -- which was more akin to a trip to the dry-cleaners. During the telecast there was a series of montages featuring the previous 79 years of winners. These victors were usually excited -- sometimes very much so. And it spoke to the potency and the cultural cache of an Academy Award. But in this 80th verison, the failure to engender even the slightest response in the night's big winners leaves our little academy no choice but to award Oscar its own statue for Idle Threat of the Week for February 18th to 24th.